Skåne Travel makes it easy to plan your journey with Skånetrafiken. 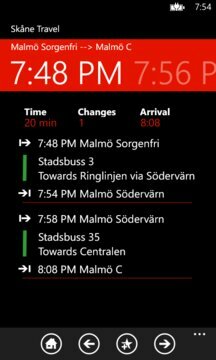 This application is well suited for both tourists and daily users since it comes in both English and Swedish. 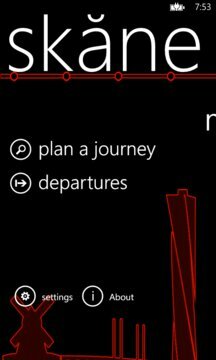 You can easily search for departures from a specific stop or from your current position (GPS). Choose when you want to depart or arrive. There is also the possibility to save your favorite stops and journeys so you conveniently can access them with one click. The search result is color coded so you quick and easy can see what color buss line you should take. You also have access to real-time departures and more.